Wow, Coldwater Creek just keeps slashing and slashing their prices. 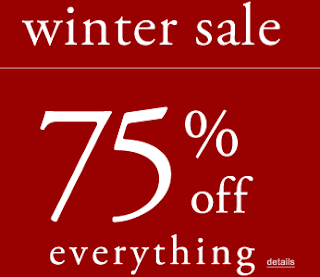 They are now offering 75% off. I tried it in the outlet store and it did work there although it said it wouldn’t. So you can really snag some great deals. Use coupon code: 75SAVE at checkout. Only one coupon code allowed so you will have to pay for shipping. This coupon code is only good till tomorrow (1/6) so don’t wait. Don’t forget, you can shop through Ebates and get 2% cash back plus $5 if you are new to Ebates so that might make up for the shipping charges.